I've long held an interest in the First World War, and spent a lot of time studying the ways in which it was portrayed in, and shaped, art while I was in university. I'm not all that familiar with the British artist Paul Nash, however. Still, the news that Dave McKean, of Sandman, Signal to Noise, Violent Cases, and Cages fame (also he did this book called Arkham Asylum you might have heard of), got me pretty excited. 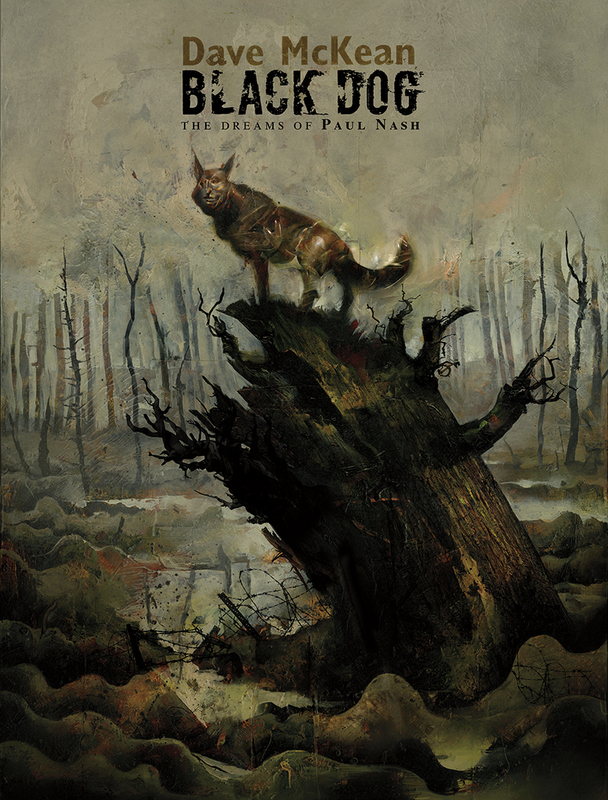 Black Dog: The Dreams of Paul Nash is, first and foremost, an absolutely beautiful book. McKean takes his usual multi-faceted approach to it, employing a variety of painting and drawing techniques to tell his equally multi-faceted story. 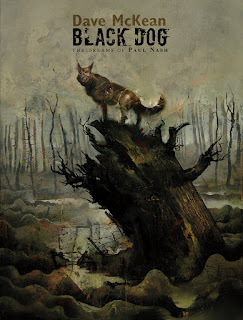 McKean explores Nash's war experiences and mind-state through his dreams, which tend to feature a black dog. The story jumps around in time and location, leaving the reader to piece together much of it for him or herself. McKean does a terrific job of capturing the strangeness of the first industrial-scale war. Nash narrowly avoids sniper bullets in one instance, and in another, is able to have a calm conversation with his brother in a underground bunker while a barrage falls outside them. Coming away from this book, I'm not sure that I learned a whole lot more about Nash, but my esteem for McKean's art has grown. This oversized volume is really lovely, and well worth owning.